The decision means 6,890 people in England and Wales who suffer with the debilitating inflammatory disease could be treated. Health watchdog NICE has agreed patients will now be able to access the drug, called Otezla on the NHS, bringing availability in line with Scotland. Otezla works by targeting a protein (PDE4) involved in the process of inflammation - by reducing the activity of this enzyme, it can help to control the inflammation associated with psoriatic arthritis, and thereby reduce the signs and symptoms of the condition. 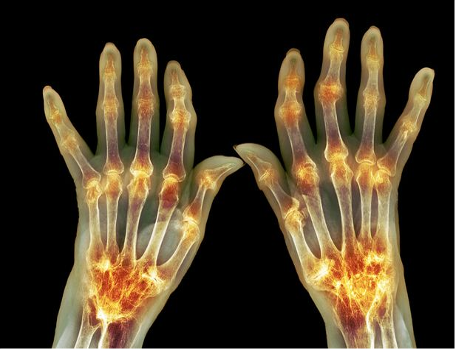 Like psoriasis, psoriatic arthritis is a long-term condition that can get progressively worse. In severe cases, there's a risk of the joints becoming permanently damaged or deformed, which may require surgical treatment. It is most common in people aged 30 years to 50 years. Living with psoriatic arthritis can hinder a patients’ ability to carry out simple everyday activities - from getting in or out of bed, to walking outdoors on flat ground. The drug was approved for use for people suffering with psoriasis in October. If left untreated, psoriasis can progress to further complications - increasing the risk people will be diagnosed with arthritis. Caralyn Burton, 51, who has psoriasis, said the drug has been ‘life-changing’. “My mother and my father had psoriasis, different types one plaque, one guttate and I developed it in 2002 at the age of 37,” she told Express.co.uk.